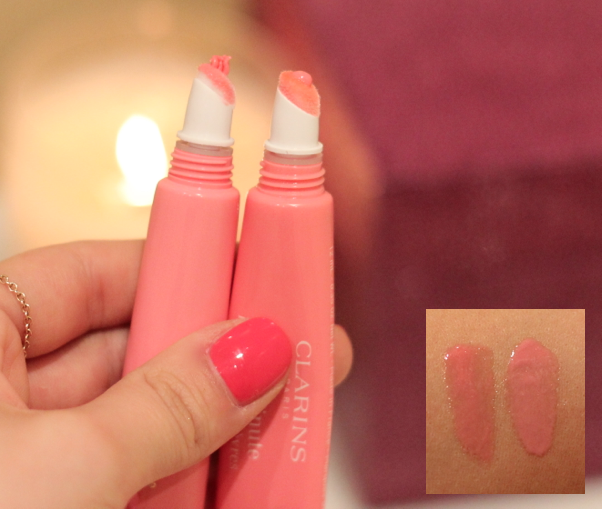 I've raved about the Clarins Instant Light Natural Lip Perfector before but rightly so! It's the perfect light moisturising gloss that adds a glow to the lips without being sticky, turning all gloss haters into lovers. No7 have recently bought out a beautiful summer collection that includes two lip glosses, similar to the Clarins Natural Lip Perfectors. Especially in packaging, which is practically the same apart from the detailed lid of the No7 Nourishing Lip Shine. Firstly the facts - for £16 Clarins will present you with 12ml of product, whereas No7 for £10.50 will give you 9ml of product. Or if you're clever and pick up a No7 £5 off voucher when you spend in Boots you could be spending £5.50 for 9ml as opposed to £10.50...makes a difference doesn't it? The main reason why I love the Clarins Lip Perfector is the smell is soo heavenly, like candy floss, but for those of you who don't agree, the No7 maybe a better option for you as it's scentless. Another reason why the Clarins Lip Perfector rocks is the light formula, feeling so weightless and non sticky on my lips. No7 Nourrishing Lip Shine is slightly heavier, only slightly though. The Clarins Lip Perfectors have a little more colour to them but both only have a very slight tint, hardly any colour at all - just add a moisturising shine to the lips. The shade I have in Clarins in No. 01 a light baby pink and there are four shades to choose from whereas No.7 Nourishing Lip Shine comes in 2 shades, a pink and a peach. The No7 pink shade comes close to Clarins Lip Perfector in 01 but just slightly darker. So what do you think? I think with those £5 off No7 vouchers that are always flying around Boots I would definitely pick up the No7 ones as opposed to the Clarins for over a £10 difference. Ps - how gorgeous is the bronzer from their summer collection too? !